Pepper kootu or ‘milakootal’ (மிளகூட்டல்) is a pepper based gravy preparation usually made with snake gourd and moong dhal. My grandmother used to make carrot milakootal! Recipes, in which pepper is used as the main spice replacing chilly are often made during convalescence. However, pepper kootu can also be made as part of the regular meal. Milakootal has the flavor of pepper and is light on your stomach. 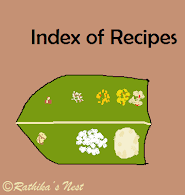 *Broad beans (அவரைக்காய் ) and snake gourd (புடலங்காய்) are often used to make milakootal. However, carrot may also be prepared in this manner. *Toor dhal may be used instead of moong dhal. Pressure cook toor dhal separately, and add to cooked vegetables. Method: Heat 1 teaspoon of oil in a kadai and fry coriander seeds, urad dhal and peppercorns till the dhal turns golden brown in color. Add asafoetida and switch off the fire. Transfer the fried ingredients to a bowl and allow it to cool. Later, grind coconut and fried ingredients into a fine paste. Place cut vegetables and dhal with 2 tumblers (400ml) of water in a kadai. Add turmeric powder and salt to the vegetables. Cover and cook on a low flame. Keep a ladle in the kadai, to prevent dhal from boiling over. Once the vegetables and dhal are cooked well, add the ground paste, mix well and bring it to boil. Switch off the fire. Heat the remaining oil in a tadka pan/spice pan (தாளிக்கிற கரண்டி), add mustard seeds, when they start to splutter, add urad dhal and fry till the dhal turn golden brown. Remove from fire. Add the seasonings and curry leaves to the kootu. Serve hot with rice and rasam or kuzhambu.